Peptide (C)GEFGGHDKPKITAWE, corresponding to amino acid residues 106-120 of rat vesicular GABA transporter (Accession O35458). Cytoplasmic, N-terminus. 1-3. Anti-Vesicular GABA Transporter (VGAT) Antibody (#AGT-005), (1:200). 4-6. Anti-Vesicular GABA Transporter (VGAT) Antibody, preincubated with the control peptide antigen. Immunohistochemical staining of rat frozen cerebellum sections using Anti-Vesicular GABA Transporter (VGAT) Antibody (#AGT-005), (1:100). 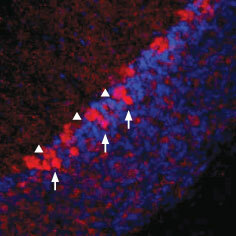 VGAT staining is shown in red and dapi (blue) was used as a general cellular marker. VGAT appears in the cerebellar pinceau (arrows) and in the soma of Purkinje cells (triangles). Gasnier, B. (2004) Pflugers. Arch. 447, 756. McIntire, S. et al. (1997) Nature. 389, 870. Bedet, C. et al. (2000) J. Neurochem. 75, 1654. Chaudry, F. et al. (1998) J. Neurosci. 18, 9733. Dumoulin, A. et al. (1999) J. Cell. Sci. 112, 811. Takamori, S. et al. (2000) J. Neurosci. 20, 4904. Mayerhofer, A. et al. (2001) FASEB J. 15, 1089. Chessler, S. et al. (2002) Diabetes. 51, 1763. The superfamily of amino acid transporters includes SLC32, SLC36 and SLC38 families. SLC32 has only one member, the vesicular inhibitory amino acid transporter (VIAAT) or vesicular GABA transporter (VGAT)1. VGAT is responsible for the uptake of GABA and glycine in exchange of protons, and their release from nerve terminals1. The transporter is organized into ten membrane spanning domains, a cytosolic N-terminus and a luminal C-terminal tail2. In many regions in the brain, where it is expressed, it is found constitutively phosphorylated, although the biological significance is currently unknown3. VGAT is expressed on synaptic vesicles of GABAergic and glycinergic neurons4-6. The transporter is also detected in the pituitary gland and in the pancreas7,8. Anti-Vesicular GABA Transporter (VGAT) Antibody (#AGT-005) is a highly specific antibody directed against an epitope of the rat protein. The antibody can be used in western blot, immunohistochemistry, and immunocytochemistry applications. It has been designed to recognize VGAT from human, mouse, and rat samples. Anti-Vesicular GABA Transporter (VGAT)-ATTO-594 Antibody (#AGT-005-AR). A fluorescent labeled primary antibody. It can be used in immuno-colocalization studies in conjunction with any of our antibodies raised in rabbit.